I was originally going to overwrite my original Anarchy in Paradise post with this one, but thought I would actually add content rather than re-write it. My first post talked about some of Bioware’s aims with KotFE Chapter 10. As I didn’t want my blog to be a ‘me too’ website, but to write what I felt like, this isn’t a walk-through. If that’s what you’re looking for, as always, Dulfy got there first. KotFE Chapter 10 Anarchy in Paradise asks the question: how far are you willing to go to bring down Arcann? 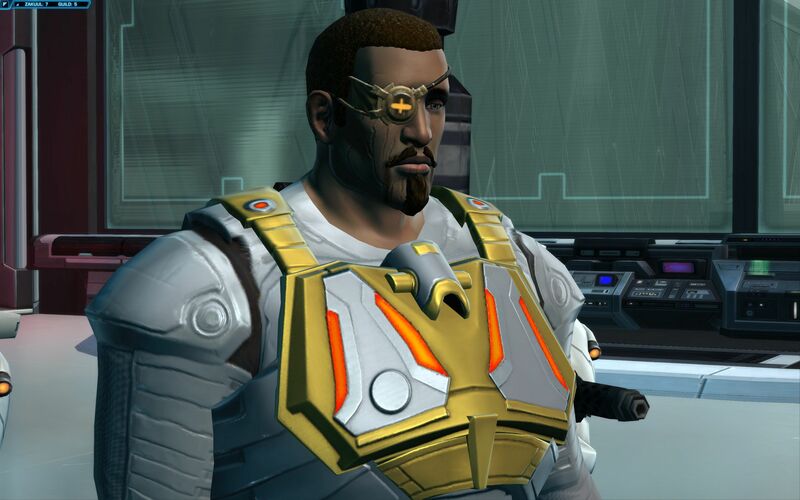 Will you just target the despot at the top, or do you want to draw all life in Zakuul to an end? It is war. In a war setting, innocents will always be drawn in. 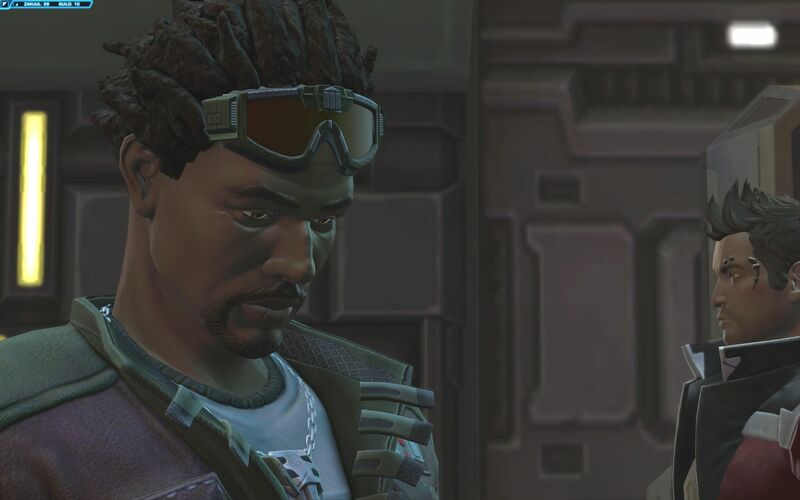 However, this situation is different, you are choosing (or not) to blow up buildings containing Zakuul’s civilians, when other options are available. I would argue that KotFE Chapter 10 is less about Kaliyo (aka Firebrand) and more about how much terror do you want to inflict when fighting a force which is dealing terror to you? I’m pretty sure, the number of times I’ve played this now, that I haven’t done a Dark Side choice yet. Not because I haven’t taken Dark-siders through Fallen Empire but because I generally hate Kaliyo. So why give her what she wants? But many are saying that Koth leaves if you blow people up. Before blowing a gasket, let’s consider why? Early on in the Story, we know that Koth is a native of Zakuul (Lana Beniko tells you that during the initial rescue mission). Deeper in the story, we learn that Koth does want to de-throne Arcann but we don’t have to destroy all of Zakuul to do it. This is his home we are attacking. It’s no different from a terrorist in real life bombing your own city or village. It’s personal and it hurts. To deny Koth a reaction that is appropriate to having your home torn to shreds is a little harsh. After all, your KotFE Alliance is made up of a lot of character types, tendancies and species. You can’t (and won’t) please them all. As we keep being reminded, Knights of the Fallen Empire is about consequences and living with them. To Ditch Koth, or not to Ditch Koth? 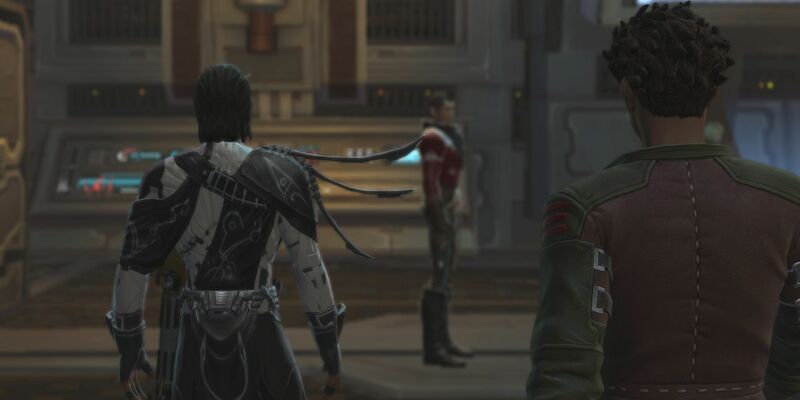 #SWTOR: what did you mostly do in Chapter 10 of #KoTFE? Pretty much a 50:50 split (13 get rid of Koth, 12 kept him). It probably depends on your character. I haven’t yet got rid of him, but he is annoying a couple of my characters so I think I may finally take the risk and see what the consequences are. Like, I’ve never let the star generator rupture in KotFE Chapter 3. Maybe I should for once? With Fibromyalgia I have to be really careful with gaming. Intense battles can cause muscle cramps and headaches. It happened with the Arcann Fight in Chapter 8. The same happens with the final Overwatch battle against Tayvor Slen, the Overwatch Administrator. With Kaliyo in Tank Mode, we just managed to pull through first time. Take down the consoles as they become active and hammer him for all he’s worth. It’s also worth dispatching the Skytroopers just to reduce the sources of DPS damage against you. Is it bad that KotFE puts me in pain? Maybe not. People love rollercoasters because of the ‘near miss’ thrill. People enjoy horror movies because of the rush of being scared half to death. At least KotFE is getting a reaction. If a movie, theme park ride or a game gets no reactions at all, then it is doomed. When you’re dealing with international gamers, you are not going to please everyone. But I think that’s better than people saying nothing about it at all! Right at the end, Arcann is so angry that ‘Father’ was on Zakuul while he was razing other worlds, that he tells Vaylin to get Knights in pairs to fight to the death in some sort of macabre gladiatorial fight. Watch Vaylen carefully. She tells him that finding his enemies will be much harder with half the number of Knights. His response? Vaylin is not happy and the seemingly invicible brother-sister partnership seems to show signs of wear-and-tear. Could she go her own way while Arcann reacts in a Kylo-ren hissy-fit way? How much does Arcann rely on his sister’s leadership and Force powers? There is definite tension there and that will intrigue me more going forward than even what happens to companions like Koth. Yes there were a ton of Skytroopers (Lana: “There’s one thing I’ve learned about Arcann: there will always be more”) and Zakuul Knights. Yes it’s hard going. But I enjoyed 99% of Anarchy in Paradise and it is good to see that actions have realistic consequences. It was also nice to finish with the relaxing mission “Little Boss” (Blizz) afterwards. But that’s gaming for you, at least there’s variety! 17:08 April 5, 2019SWTOR Fan Community to Hit Star Wars Celebration 2019! I was disappointed how utterly THE SAME Kaliyo was, even after five-plus years since our characters have supposedly seen her. Seriously, she seemingly hasn’t changed much at all. While it could be argued, that the events involved in losing a crew she’d become a part of and even maybe someone she loved actually exasperated her feelings and beliefs — basically, “See, I was right all along! Caring is crap and I’m better off on my own and blowing stuff up!” — I still felt let-down by the utter sameness that Kaliyo’s interactions seemed to convey. It surprised me how bored I became playing along with her again. I just wanted to smack her, and shout, “Friggin’ grow up, girl!” Oh, well … I’m looking forward to Chapter 11. I can’t imagine Kaliyo would ever change in her attitudes though. Even during the Agent phase she was chaotic, disrespected authority and would take any chance at bringing her own explosiveness to situations. Predictable? Maybe, but old habits die hard I guess! My first play-through was on my Sniper. Just to define the relationship between her and Kaliyo. On Hutta, Andri told her straight, “I’d rather shoot you in the head.” But that changed over time. Those two welded themselves into a pretty damned unstoppable team. The Agent waits longer for their 2nd companion than any other class. All that time really bonded those two. I found myself less effective with the other companions, so I pretty much stuck with Kaliyo whenever I could. Not even Scorpio could hold aggro as well. So when the time came for that last companion mission with Kaliyo, Andri, while not forgiving Kaliyo and making it clear it that selling information couldn’t continue, affirmed their bond. “You don’t have to believe in the Empire, just believe in us.” Kaliyo really responded to that, I think. I always love your perspectives Kaylen. And I have to agree about Kalyio and Agent. My original Agent hasn’t started KotFE yet, but although Temple tried to flirt with him, she was too immature. Kalyio has grit. Yes, she is unstable, but I learned through the Agent story that ironically, rebelling against ‘the system’ actually helps keep you alive when ‘the system’ is taken away from you. As for the killing civilians, I think I have one falling Jedi who might do it and when my DS Assassin takes up the story, she won’t care about Koth so what the heck really. But most of the time, you need to build an alliance which is radically different to the Eternal Empire. Just because Arcann kills civilians on a whim (in a hint of Valkorion for that matter) doesn’t mean you Alliance should follow suit. So I don’t think many of my characters will permit the civilian casualties, the effect on Koth aside. Haven’t played with Kalyio apart from the Agent story line. They just never clicked. They were at each other’s throats constantly with everything but as the going started getting harder, they started melding more. The other reason is that He never clicked with anyone else, I know I’m copying somewhat from Kayeri and for that I apologize, and that was for many reasons. Scorpio, where do you even start? She’s cool and all, being an advanced self aware droid, but her Heuristic directive is just too weird for me. Raina, well she may have a chest, and that may help, but through her personality she feels too young, and even more like a student to me. Lokin, he’s the father my Agent never had. And cause of the bad experiences he has with his biological one, he wants to trust him but can’t afford to be betrayed anymore. Vector, he’s his hearts brother but he’s also guilty of making him betray the Kelsiik to save Cortess. That prevents the agent from truly being a brother to him. Going to play Chapter.X soon and will let you know what I thought of seeing her after 5 years again. Pst. Do you know if Using Valkorians power in Ch.VIII to push Arcann off the spire abd kneeling in Ch.I makes it so that you can’t refuse anymore? The only situation I have found you can’t refuse is if you accept his power to save Lana Beniko and then in the Scion Trials against Heskel, you have no choice but to use his power against Arcann. Kneeling didn’t make any difference to his ability to ‘force’ you do anything. As far as I’ve noticed and I’ve easily done 8 runs from Chapter 1-9. Well Just played Ch.X and I’ve gotta say my mind is blown completely……..The enemies were hard even when wearing almost all 220s, except for 1 208 relic and my light saber with its mods apart from the hilt being 208 too. Oddly enough, it was only the elite packs and Overseer Tayvor that made it close in the end. Well anyway, I loved seeing Kalyio again even on the Inquisitor. I actually ended up bombing the city cause as Valkorian said, “The chaos allows us to become greater than before.” Doesnt help that the Fireworks were awe inspiring. As for Kalyio? She’s still the same awesome girl as she did before. Sure she’s rougher now that she lost Cipher 9 but that just adds more to charm than anything else. And as she’s a fellow pyro, and seeking revenge too, It allows them to bond completely and more easily. And yes, if you lie to Koth he doesn’t leave. Tayvor is really hard. I found it easier on Heals as I can survive. DPS Ranged is hard as he keeps moving. The trick is to deactivate the consoles as soon as you can. And, if you have some, Legacy Heroic Moment abilities help too. Good/sad to know lying keeps a friendship! Take that how you will. One of my alts will bomb Zakuul, but that’s just because he can’t detach Zakuul from Arcann any more than the Republic can detach the Empire from the Sith Emperor. Do you run SWTOR in Window mode rather than full-screen? I’ve run this chapter a number of times and nothing bugged out (thankfully, it’s a 5-8 minute battle on average for me – but I roll more tank/deals than DPS which may be why).